Texas Brussels Griffon Rescue View other Brussels Griffons for adoption. Bonnie is one precious little girl. If you are comfortable giving her a shot twice a day for Diabetes, and don't try to take anything away from her when she has it in her mouth, you will love having her in your life. She is 10 yrs. young, 12 lbs, fully vetted and ready to meet her new family. Bonnie was surrendered to NBGR by her previous owners, who had her since she was a puppy, when they could not handle her daily medical requirements. She had recently been diagnosed with diabetes, and that means she must have two insulin injections a day. Her previous owners were very nervous about giving injections, and the few times they tried, they bent the needle. Bonnie reacted aggressively. Bonnie is a sweet little girl, but she has a couple of quirks that will require her new family to be cautious. Bonnie is aggressive when it comes to her food bowl. If you put your hands near her bowl when she is eating, she will bite. She does not react if you walk around her while she eats or stand over her while she is eating. She only reacts if she fears you will take her food. On the other hand, Bonnie does not react at all to other dogs being near her food or bowl. She is also very polite when treats are being passed out and will sit patiently until it's her turn. When we first brought Bonnie into her foster home, she reacted to being startled awake by biting. That has not occurred since she has relaxed with us. Now that we've addressed the negatives, let us tell you all the wonderful things about Bonnie��%BD'��%BD| Bonnie walked into her foster home as if she had always lived here. She's house-trained and will pretty much go outside to potty on command. She is crate-trained. She LOVES meeting people, and she gets along great with other dogs. When she first moved in, she was not inclined to sit on the sofa next to us, but preferred to lay in a bed on the floor or underneath a table or chair near us. Now she definitely wants to be on the sofa with us. She generally follows us from room to room, finding a comfortable spot nearby. Bonnie is leash-trained and enjoys walks (though sometimes she prefers to be carried like a princess). She is very curious about the people she sees along the way, but she tends to ignore other dogs. Even if her foster-sibs are all barking, Bonnie remains calm. Bonnie sleeps through the night, pretty much without moving, at our feet on our bed. 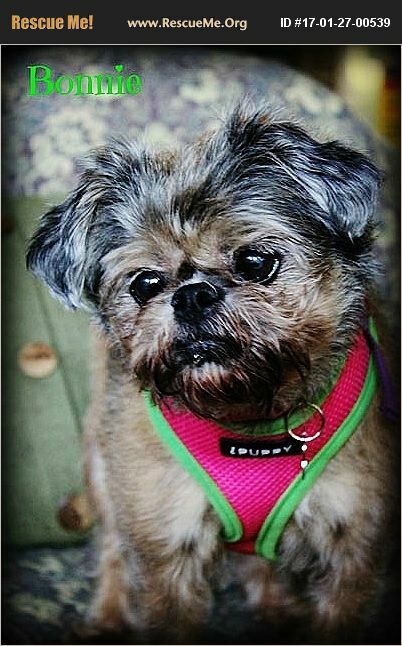 Bonnie has accompanied her foster mom on a few home visits and was delightful. She captures and melts the hearts of everyone she meets. Bonnie travels beautifully in her crate and really enjoys car rides. Bonnie needs to live in a dog-savvy home. Bonnie will need a family who is willing to administer her insulin and continue monitoring her health with additional tests from time to time. Her diabetes requires her to eat, then receive her injection, on a regular schedule (every 10-12 hours). She also needs drops in her eyes twice a day. This is done most simply right after she gets her insulin. Due to her aggressive tendencies, Bonnie will not be allowed to go to a home with children or a home where children visit often. She has not shown any aggression toward children, but we cannot take a chance of a child getting near her food bowl or picking up a toy Bonnie feels is hers.